Yoga session on the farm followed by a meal from our partners at Eat Sprout! 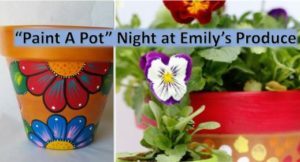 Grab a couple friends and enjoy a night of fun and Spring festiveness! You’ll be putting some creative touches on a Terra Cotta Clay Pot that will look BEAUTIFUL with spring flowers planted in it! Your VERY talented instructor will be Bonnie Tarr Cox of Swamp Bonnie Art!